De nummer 1 Italian dressing in Amerika! 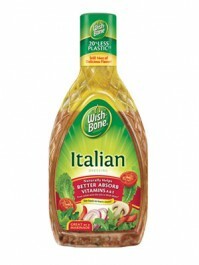 Wishbone Italian Dressing is gemaakt van voedzame oliën welke je helpen om het beste van je salade te maken. Water, Soybean and Canola Oils, Distilled Vinegar, Sugar, Salt, Garlic (Dehydrated), Onion (Dehydrated), Red Bell Peppers (Dehydrated), Maltodextrin (Corn), Xanthan Gum, Spices, Autolyzed Yeast Extract, Calcium Disodium EDTA (Used to Protect Quality), Natural Flavor, Lemon Juice Concentrate, Caramel Color, Annatto Extract (Color).